Big Kamikaze is the new generation slide which offers one of the most extremly descent 26 meters high. Users descend the steep edge starting off in the pool. Length of the slide is 67,5 meters. Small Kamikaze starts on the length of 17,5 meters and 62,5 meters. Offers one of the fastest drives in your life with maximum safety. This slide is one of the most popular slides in Aquaparks. Rafting slide is wide open slide with 13 meters height. In funny decent 122 meters length you can enjoy with kids, partner or friends. Tornado slide is a closed slide that offers you a dark and unforgettable descend which is 145 meters long. Black holeslide is a tube-shaped closed slide that offers you an unforgettable adventure which you can experience individually or share it with someone else. 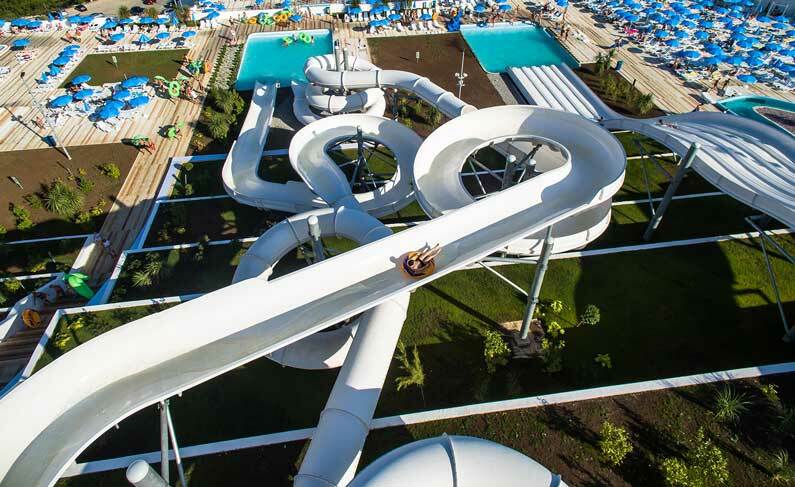 Multi slide, like an obligatory part of every Aqua Park, is yet another great slide that we offer to you. In our Aqua Park this slide has 6 lanes, so that you can really enjoy a descend downhill this slide together with your friends and family.